The widespread use of antibiotics among humans, coupled with the unnecessary use of the medications in the animals people eat, has led to the rise of drug-resistant “superbugs” that have become resistant to antibiotics. Antimicrobial resistance currently claims the lives of about 700,000 people worldwide each year, but experts warn superbugs could take 10 million lives each year by 2050, making it a bigger health threat than cancer. Bacteria resistant to all antibiotics – including carbapenems, a class of antibiotics used when all others have failed – is already in the United States. The FDA is not without its critics, and some experts say the new rules don’t have enough teeth. The Natural Resources Defense Council, for example, is frustrated that farmers will still be allowed to give their animals antibiotics for disease prevention. 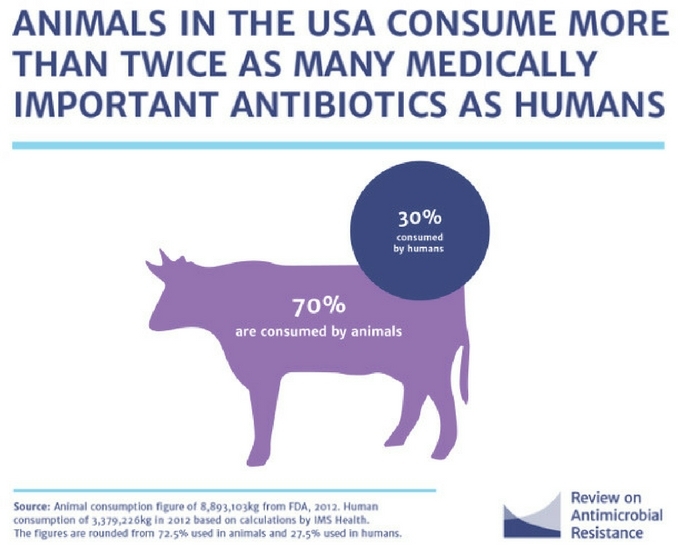 Regular, widespread antibiotic use on farms will continue, the NRDC says, and when bacteria in livestock become antibiotic-resistant, humans are at risk of contracting the ultra-tough bugs through handling and eating raw or under-cooked contaminated meat. Humans are also at-risk when they drink of swim in water contaminated with animal feces, and when they care for animals.